2015 Leaf Legends of Sport covers a lot of ground. 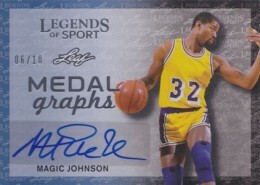 The all-autograph release includes athletes from several sports covering several generations. Each box comes with seven signed cards. 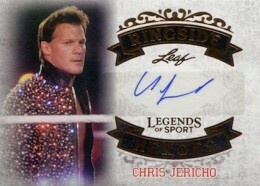 Base Autographs comes with a straightforward design. It mixes current, retired and young stars from such sports as baseball, basketball, football, soccer and tennis. Cristiano Ronaldo, Lionel Messi, Mike Tyson, Bill Russell, Roger Federer, Andrew Wiggins, Pelé, Neymar, Jerry Rice, Jameis Winston and Cal Ripken Jr. are among those in the product. 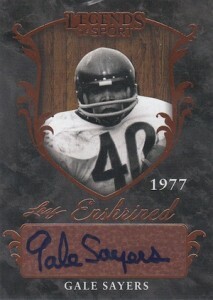 Only Hall of Famers are included in the Enshrined Autographs insert set. 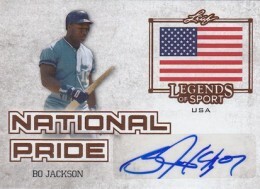 The design for National Pride showcases the flag of the country the featured player hails from. A couple parts of 2015 Leaf Legends of Sport are dedicated to specific sports and themes. Cup Dreams has athletes who have played in the World Cup. Ringside Heroes centers on athletes who do the thing inside the squared circle. Medalgraphs has only Olympic athletes. 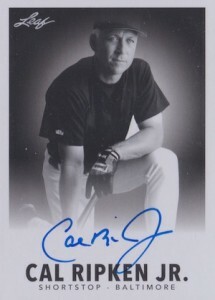 Cards signed by multiple athletes are also randomly inserted. All parts of 2015 Legends of Sports come with multiple parallels. The product has a limited production run of 200 cases. Each has ten boxes. DA-07 Pete Rose / Cal Ripken Jr.
TA-01 Ronaldo / Messi / Neymar Jr. Opened one box. Was very happy with the variety of autos. James Rodriguez soccer auto #d out of 10. Anna Kournikova auto. Summer Sanders auto #d out of 10. Don Sutton auto #d out of 25. Gina Carano auto. Pedro Martinez auto #d out of 2. Finally an Elvis Hayes auto. Not bad compared to what I could have pulled out of a lower end product. Very satisfied.